This bright and Summery syrup is deliciously fruity and will bring some sunshine to any gloomy day. Enjoy the authentic taste of sweet banana in cappuccinos, lattes, americanos and more. If you are getting bored of the same tea or coffee every day, this syrup is a great way to try something new and mix things up. Experience a truly tropical taste which can be added to so many of your favourite recipes. Just start with a splash to try this syrup flavour, as a little goes a long way. It is delightfully sweet and tastes like a perfect ripe banana. Skip the sugar and sweeten things up with this product and be rest assured that it will only compliment your beverage and won’t overpower it. DaVinci have always been dedicated to using the highest quality ingredients. This is what gives the product a gourmet taste that you can rely on to deliver excellent results every time. You can also rely on this product to be safe and not cause accidents or spills in your kitchen or coffee shop. 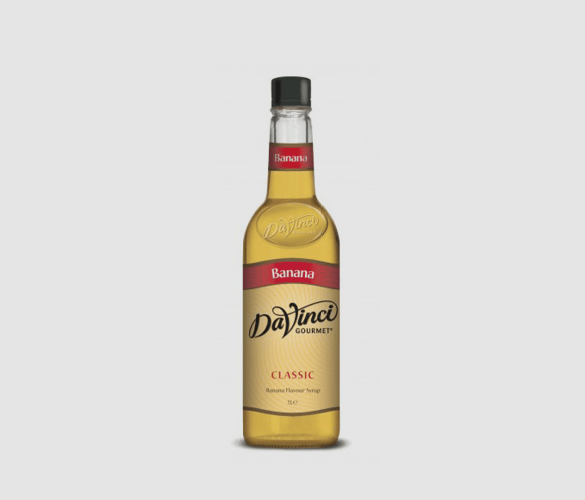 DaVinci have designed a user-friendly plastic bottle which is much safer than glass products. So, when your kitchen or coffee shop gets a busy spell and an accident happens, this bottle will not break and shatter glass shards everywhere. Can I Use Banana Syrup in Coffee, Milkshakes, Cocktails and Other Drinks? This formula has been specially designed to resist curdling with dairy products. This means the syrup will dissolve seamlessly into your beverages, resulting in a silky smooth drink. Cocktails – Sometimes its great to have a night in with friends and re-create your favourite cocktails at home. Add a splash of this syrup to give a subtle sweetness to your tropical creations and convince your friends that you’re a professional mixologist! Coffee – This flavour works great in coffee as it’s not too sweet or over powering. Start with a little to get a feel of how much syrup works for you. Tea – We love putting this product in tea as there are so many flavour combinations to experiment with! Black, fruit or herbal tea are all delicious ways to enjoy this syrup. Milkshakes – thick, indulgent and simply delicious. Banana is such a popular flavour of milkshake, and this product is the easiest way to re-create the authentic taste. Ice-cream – A drizzle of this product will turn a boring bowl of vanilla ice cream into a tropical paradise. Desserts – This product works perfectly with so many dessert recipes. Drizzle over waffles or pancakes, stir into your cake or brownie batter, or add some extra flavour to your banana bread.